Cut thin slice off bottom and top of each apple. Using paring knife or apple corer, remove core from each apple. In 8- or 9-inch square microwavable dish, place apples upright. Pour 2 tablespoons water over apples. Cover with microwavable plastic wrap, folding back one edge or corner 1/4 inch to vent steam. Microwave on High 8 to 10 minutes or until apples are tender. Reserve 1 tablespoon cooking liquid. Cut each apple in half. Place 2 apple halves in each individual serving bowl. 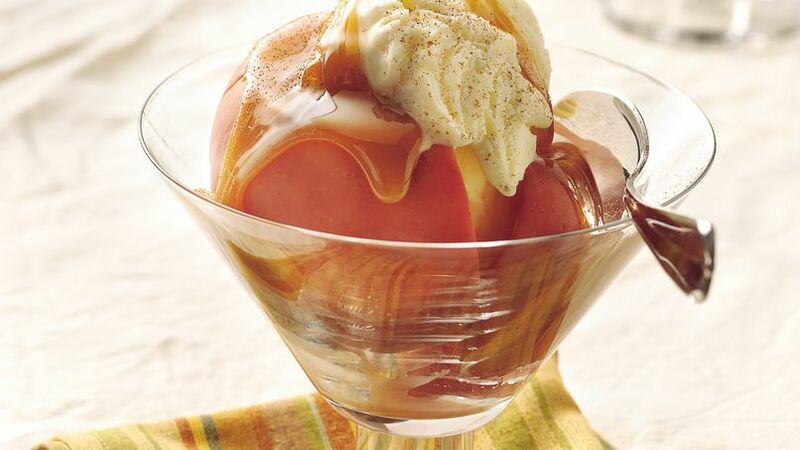 For each serving, spoon 1/4 cup ice cream between apple halves. In small bowl, stir caramel topping, 1 tablespoon cooking liquid and the rum; pour over apples. Sprinkle with cinnamon.